Glow wherever you go with our shine collection including new Vivid Hot Lacquer. 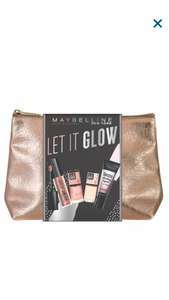 All products come in a stylish rose gold metallic make up bag! Don't be afraid to be cheeky! Define, highlight and add colour with our must have Sweet Cheeks Gift Set. Make me blush sculpt, contour & glow! Great deal if can find it. all the Tescos' close to me seemed to suddenly have no stock of the Maybelline and Bulldog sets when they went half price. Tried to order online as well. Bayliss and Harding and Calcot Manor, Lynx and L'Oreal sports set for men galore but that's it.